As I was putting the finishing spring touches to our sim, I came across one of my fave old bird baths from summer 2007. It holds many memories, and is still kind of pretty, but I felt like something new this year. 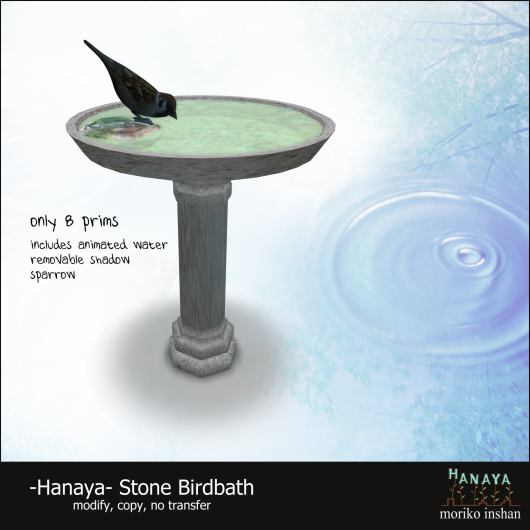 So here are 2 new birdbaths from -Hanaya-. One for a casual garden or forest clearing look, and the other a bit more formal for those of you that are into that style. A sparrow perches on the cast concrete of the birdbath, which is cradled by 3 branches of an old driftwood log. A bit of ivy embellishes the log and adds only a few prims to the piece. Gently rippling animated water surface adds realism. A traditional pedestal bird bath with water surface ripples spreading out in a pattern from the spot where the sparrow drinks. Only 8 prims, in fact 6 if you remove the 2 prim shadow at the base of the column. The birdbaths are currently rezzed out on the grounds of our in-world store, and are available for purchase in the New Products area of our store, directly inside the front entrance. Since the roll out of Direct Delivery on March 21st, the Second Life Marketplace continues to experience severe issues. These range from slowness, to failed deliveries, to customers receiving the wrong goods, customers paying but merchants not receiving the funds, and mixed up listing images/products and pricing. As one reporter on the JIRA said, shopping on the Marketplace right now, is like playing a Gatcha! You have no idea what you will receive. It is my personal recommendation to my customers that they shop in-world for our products until the Second Life Marketplace issues are resolved and the platform is stabilized. If you are unable to teleport, or wish to purchase an item as a gift, please do not hesitate to contact me – I am most happy to help you to avoid issues with the Marketplace. If you would like more specific information about the issues, please contact me for a list of JIRAs that touch on this topic. Please note, therefore, that the new releases in this post will not be available on the Second Life Marketplace until further notice. Thank you for your continued support, and have a great weekend. 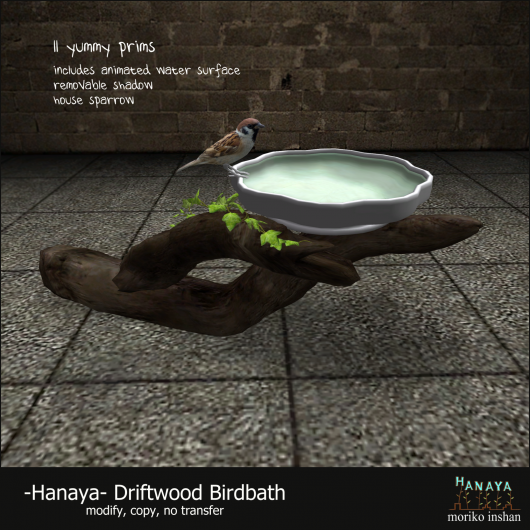 This entry was posted in News, Opinion, Product Announcements and tagged -Hanaya-, birdbath, Direct Delivery, Second Life Marketplace on March 30, 2012 by moriko. More spring flowers – both low prim and primtensive. Yeah, my newly coined phrase. For those of you who are lucky to have available primage. Primage, Second Life’s equivalent of acreage. Another new word – I am on a roll this morning. But really, this blog post is all about sculpted spring flowers for your Second Life. All of these lovely flowers are rezzed and on display, ready for purchase, in the New Products area of our in-world store, as well in our web store on the Second Life Marketplace. Simple is best – partly filled mason jar with water, 3 tulips and a teeny bit of shadow to give it that extra special look. Please keep the lid off until your tulips wither away, but don’t lose it – we will be making jam in June and July. By the way, I never Photoshop the product part of my vendor ads – that wonderful shine on the jar is on the texture. Lovely isn’t it? 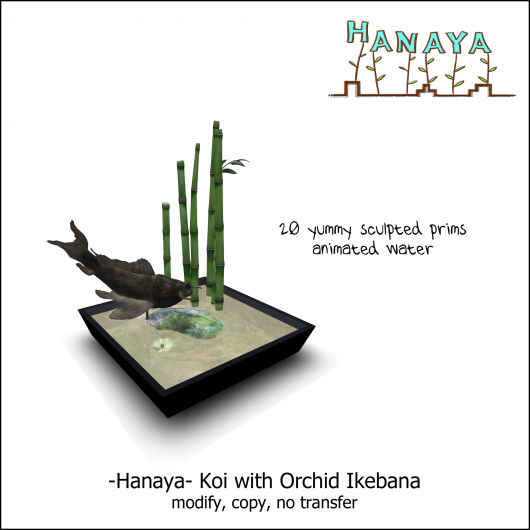 Another ‘simple is better’ piece – an exquisitely detailed koi presides over a bowl of subtly animated water with bamboo, rock and a single orchid blossom. Enough said. Ok, so kill me. Simple is not always best. Sometimes an extravagant display of prims (yes, it is 58 prims, fifty-eight) is just wow. Like the spring version of our All My Love Bouquet, which you guys wanted in pink tones. So here it is – please enjoy. And one more for the un-primconscious (yay another new word) – a wonderfully creamy pink variety of our long stemmed roses. And look at it this way, you can just drag them out when you have company coming to dress up the place. They are guaranteed not to wilt, get dusty or thirsty in the depths of your inventory. In a previous blog post, I promised that our new vendor system would be implemented in the month of March. Yeah, this month – the one that is almost over. Guess what? Not happening just yet. I have been busy with a large number of custom orders, as well as the design and build of a community sim for a large estate in Second Life. More information on that soon. Also, with Direct Delivery on the Second Life Marketplace, as well as yet to be resolved issues with how vendor/sale tracking systems will interact with it, it makes sense to put off our implementation of the in-world vendor system. So .. it is on the task list for actioning as soon as it makes sense. I will keep you guys informed. In the meantime, if you want one of our products with different permissions, or to gift deliver it in-world, please do not hesitate to contact me. Likewise, for those of you in my -Hanaya- Yummy Collectibles VIP group – if you make an in-store purchase, please ping me with your transaction information and I will gladly refund you the 10% of the purchase price, which you, as a VIP group member are entitled to effective April 1, 2012. And my real life vacation in Italy, May 17 – 31st. Hope they have wifi! This entry was posted in Events, News, Product Announcements on March 28, 2012 by moriko. In my real life neighbourhood, daffodils of many sizes, shapes and colours are blooming like crazy. So is a pot of forced ones on my kitchen table. So it seemed like the right thing on this fine Monday to bring some daffodil sunshine to my Second Life in-world store. 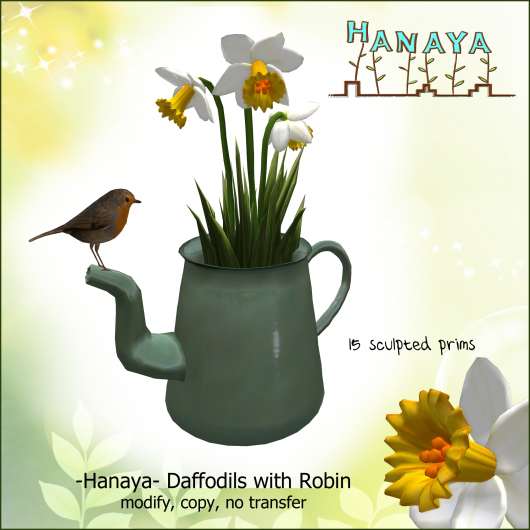 Our Daffodils with Robin will add a whimsical touch to any home or garden this time of year. And yes, it is a European Robin, not its North American larger cousin that I most often incorporate into my products. A little cup stuffed with daffodils is just the thing, in my opinion, for a sunny window sill, kitchen counter, or a protected ledge in your garden. At only 11 prims, perhaps you can scatter a few of them around to bring spring cheer to your surroundings. 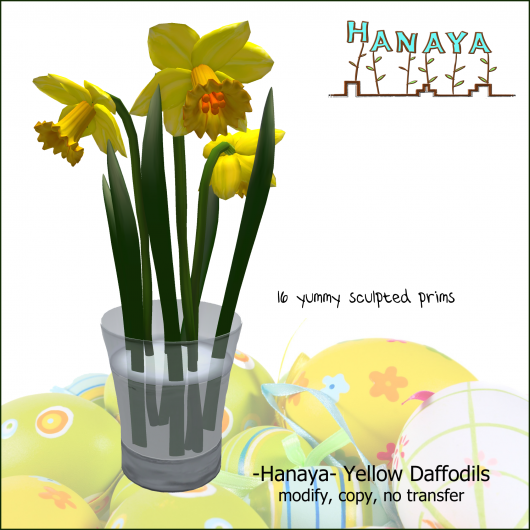 For traditionalists, we have yellow daffodils with a more realistic (but primmier) foliage. Freshly snipped in my greenhouse garden and popped into a glass of water for your enjoyment. 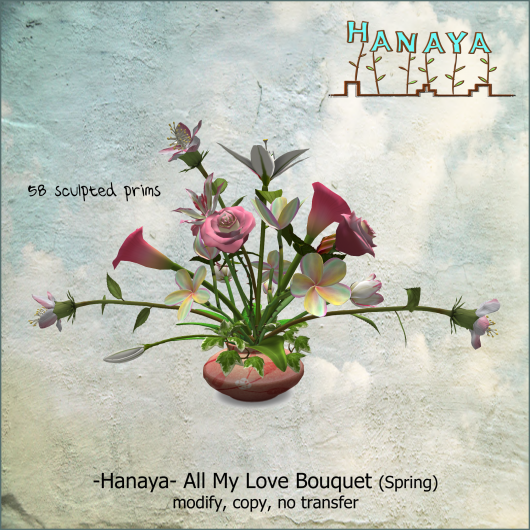 All three brand new daffodil releases from -Hanaya- are available for purchase at our in-world store, and soon on the Second Life Marketplace. I hope you have a bright sunshiny day! 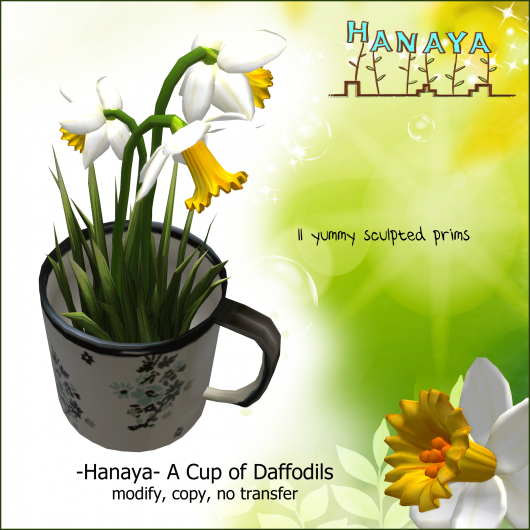 This entry was posted in Product Announcements and tagged -Hanaya-, daffodils, spring on March 19, 2012 by moriko. March – a month of uncertain weather and the promise of spring. And thorough house cleanings – you know, out with the tired and dusty and in with the new. 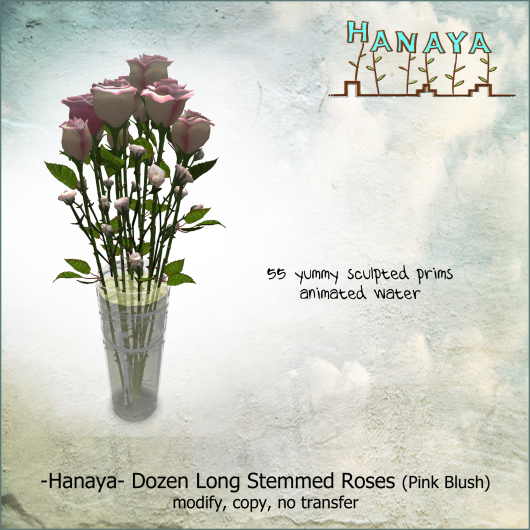 First, I am happy to announce that the -Hanaya- in-world store has shed most of it’s winter look, and is starting to look like spring is just around the corner. Wintery demos of products have been shelved and new stuff will be appearing before you know it. 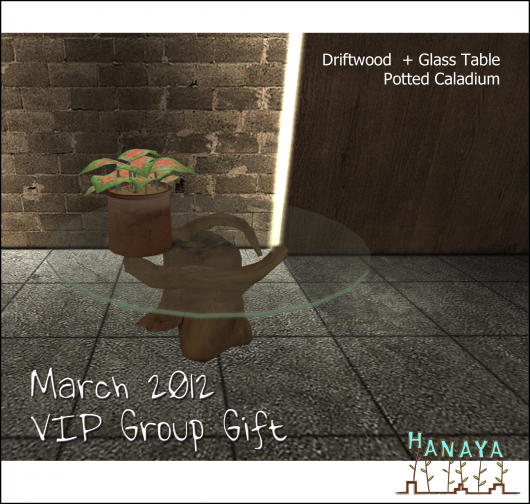 One new thing is this month’s -Hanaya- Yummy Collectibles VIP Group Gift, which is being sent out today on the group. If you miss yours, please grab it from group notices, or better yet, stop by the store – it will remain available in the Customer Information area for the whole month of March. For those of you not members, please note that there is a 250 Linden group join fee. 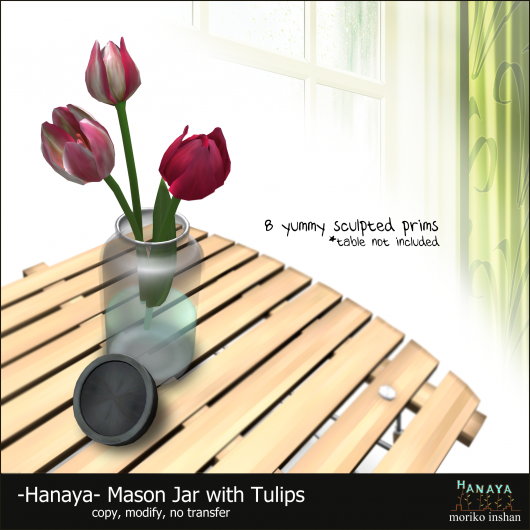 Three major undertakings for -Hanaya- this month. First, a summery line of yummy collectibles, plants, as well as home & garden decor is currently in development. Expect explosions of colour and texture and delicious primness. make in-store gift cards available. Part of the vendor system may see a few changes to the layout of our in-world store – so keep an eye out on things, and please excuse the mess. Lastly, we are taking a lead in a large sim development project, so notices may be a teeny bit scarce over the next few weeks. Yay, less spam from us for a bit! We will be participating in Culture Shock 2012, which will be on from May 5 – 26, 2012. So please stay safe, stay happy and have fun! This entry was posted in Events, Freebies and Gifts, News and tagged Culture Shock 2012, gift cards, gift delivery, Second Life Home & Garden Expo, vendor system on March 1, 2012 by moriko.